Anyone who has been in Arizona during the summer understands why misters are so important. Misters line the awnings of shopping malls and restaurants throughout the Valley, dispensing a cloud of heavily pressurized water droplets that absorb heat and quickly evaporate. These droplets can cool the temperature by up to 30 degrees, making a huge difference to anyone in their immediate vicinity. Local cooling-solutions business Mr. Misters is working to bring that same cooling experience to boaters. 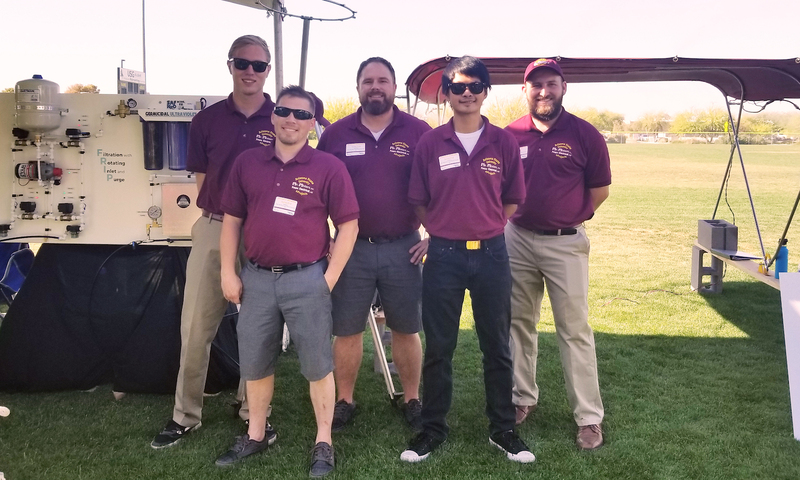 For the past academic year, Mr. Misters has partnered with students at the Polytechnic School at Arizona State University to develop a misting system for small watercraft. The few boat misting systems on the market attach to the vessel’s shade structure, called a Bimini frame. The misters use the boat’s power to pull water from an onboard refillable tank. ASU students worked with Mr. Misters to design a new misting system that operates using an independent solar-powered battery that pumps and purifies water directly from the lake through the frame to the misting heads, eliminating the need for an onboard refillable water tank. The design process initially began in fall 2016 when David Wright, an Ira A. Fulton Schools of Engineering alumnus and son of Mr. Misters co-founder Duane Dempsey, had the idea to develop a boat misting structure powered by a photovoltaic system, more commonly known as a solar-panel system. One of Wright’s former professors recommended he get involved with the Polytechnic School’s eProjects program to help develop his idea. The eProjects program is just one way the Fulton Schools allows students to gain hands-on work experience. Each academic year, teams of four to eight students collaborate with an industry partner to create innovative solutions for projects proposed by and funded through industry partners to solve real-world problems. Industry partners have ranged from Fortune 100 companies to one-person fashion designers, and the projects challenge students in skill sets ranging from robotics to electrical engineering. For up to two semesters, students earn credit through engineering courses EGR 401/402: Professional Design Project I/II. However, many students’ commitment to the projects extend far beyond their class credit, with some spending 20 to 30 hours a week developing the projects. During spring 2017, an eProject team presented Phase Zero of the boat misting system project at Innovation Showcase, a massive exhibit of projects at the Polytechnic School produced through student-industry collaboration. The initial phase consisted of a preliminary design for a misting system that could be attached to any Bimini frame but prevented the shade structure from retracting when not in use. Despite students completing a full academic year of work on the concept at the time, the project was far from completion. So in fall 2017, the boat misting system project was divided between two teams for Phase One. Students ranged from an electrical systems major who had experience working with solar photovoltaic modules, to an automotive systems major. The first team worked on redesigning the Bimini frame with the goal of completely integrating the misting system into the framing structure. Meanwhile, the second team began creating a system that could collect water from the lake, then pump and purify it for use in the misters. Because this type of frame is not currently on the market, the team would need to construct a stainless-steel frame — a challenge considering its size and the difficulty of working with the material. No one on the team had welding experience, and welding the frame was not a task for a beginner. After a month of searching, the team connected with Harder Mechanical, a construction contractor. As it turned out, their point of contact at the company was also a Fulton Schools graduate. Paying it forward, Harder Mechanical agreed to comp the labor as long as the team provided the material. Throughout the semester, the team met at least once a week, completing paperwork for the class, discussing ideas for the project and working with their advisers. A project manager kept track of logistical progress, while the team members held regular discussions with their Mr. Misters liaison to focus on outlining objectives and materials selection for the design. The Bimini frame redesign and pump system debuted at the Spring 2018 Innovation Showcase. And with another academic year of progress behind them, the team still sees opportunities for improvement — such as incorporating foldable solar panels that will perform to their desired standards. The team realized financing a new design of the panels would significantly strain their budget and had to display the Phase Zero version of the panels at the showcase. Though not every goal was accomplished, this project has progressed over the past two years from a concept to an operating Bimini frame that the students have taken out for a trial run on the lake. Wright appreciates the students’ work and helping realize his idea for a better misting system for small boats. While many of the eProject team members graduated this spring, Wright believes that Mr. Misters will continue working with the Polytechnic School students for the testing and improvements to come in Phase Two. Can parenting skills prevent childhood obesity? Researchers in Arizona State University’s Department of Psychology received a five-year grant for just under $2.5 million from the USDA to implement an intervention program that targets childhood obesity in a novel way: by teaching parenting skills. In the United States, approximately 9 percent of children ages 2–5 years and 17 percent of children ages 6–11 years are obese. Childhood obesity can lead to lifelong health problems, even early death, and is linked to greater rates of depression and mental illness in young children and teenagers. Children who are ethnic minorities and who come from low-income families are the most likely to be obese. Cady Berkel, associate research professor of psychology, and Justin D. Smith, who was a postdoctoral scientist in the ASU psychology department and is now an assistant professor at Northwestern University, are the lead investigators on the grant, which begins July 1. Berkel and Smith are trying to reach at-risk children ages 2–8 years before unhealthy eating and physical activity habits become established. The centerpiece of their project is the Family Check-Up 4 Health (FCU4Health) program. The FCU4Health program relies on medical offices or clinics throughout the Phoenix metropolitan area that offer integrated primary care and behavioral health services. “The FCU4Health program is a unique childhood-obesity prevention program because it focuses on the parents to reach the kids,” said Berkel, who is also part of the ASU Research and Education Advancing Children’s Health (REACH) Institute. Research on childhood obesity shows that simply informing parents about healthy eating habits and the importance of physical activity is ineffective at preventing or overcoming obesity in children. Berkel said parents might already have information about how important physical activity and nutritious foods are to their child, but actually changing a child’s diet and behavior can be difficult. Like other REACH Institute programs, the motivation behind the FCU4Health program is that parenting skills are teachable. In the FCU4Health program, families meet with an on-site health coordinator, who has been trained by scientists in ASU’s REACH Institute. The coordinator teaches the parents skills that will help them implement the pediatrician’s advice. Such skills might be as simple as providing praise when a child makes healthy choices. Some of the parenting skills taught in the FCU4Health program are setting limits, managing children’s screen time and rewarding positive behaviors. Berkel and Smith’s project will study how effective the FCU4Health program is at preventing obesity in young children and will estimate how much money the program could save the health care industry. Another goal of the project is to broadly disseminate strategies parents can use to support healthy behaviors in young children. Berkel and Smith will be supported by other ASU scientists. Meg Bruening, assistant professor in the School of Nutrition and Health Promotion, will oversee the nutrition information included in the online learning courses, and Anne Mauricio, associate research professor of psychology and implementation scientist in the REACH Institute, will help with the training and education of the health care professionals. Kevin Grimm, professor of psychology, will serve as the biostatistician for the project.